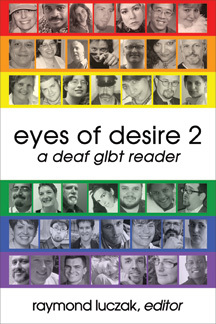 Anthrogeek Jason Romero let me know of the publication of the new edition of a classic -- Eyes of Desire 2: A Deaf GLBT Reader. Definitely a must-buy. Amazon doesn't have it so you need to order it through the publisher: http://www.handtype.com/books/eod2/eod2.html ($20 + $3 shipping). This page is a archive of entries in the Info - Useful information category from October 2007. Info - Useful information: May 2007 is the previous archive. Info - Useful information: November 2007 is the next archive.